…or you can travel about a mile or so from home and find something fantastic for about a dollar. Very early in our collecting career, nearly forty years ago, we went to a local auction and paid four dollars for a lot of four bisque bathing beauties that were made in Germany. They were delicate and well-detailed – and three of the four were naked! Even at that time, four dollars was a steal. This purchase made us notice other bisque bathing beauties and naughty bisque figurines when we went to shows and antique shops, and over the years we saw prices steadily rise from about $25 to $100 and more. Some larger figurines were often priced at over $200. In fact, several years ago when “The Antiques Roadshow” was in Atlantic City, they did a special segment on bisque bathing beauties, so they are quite desirable and collectible. 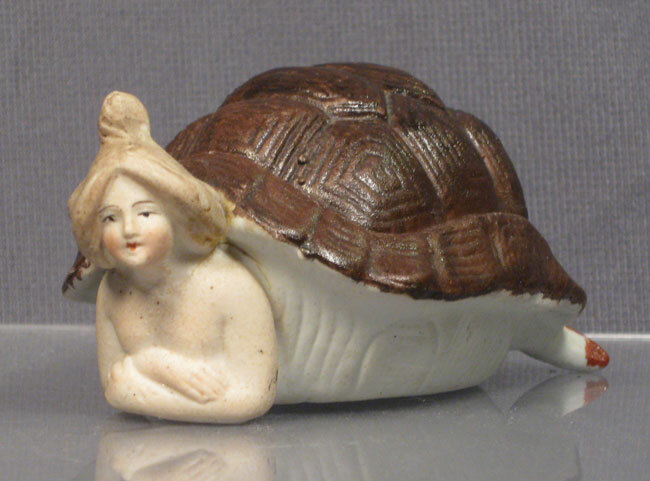 We have always thought the turtle shell naughty figurines are especially intriguing. How bizarre they are! There’s the pretty Victorian girl’s head sticking out of the rather large tortoise shell. You lift off the back of the shell and – voila! – there’s the rest of the girl. Oftentimes the girl’s undies are showing. Sometimes even her bare bottom is showing! 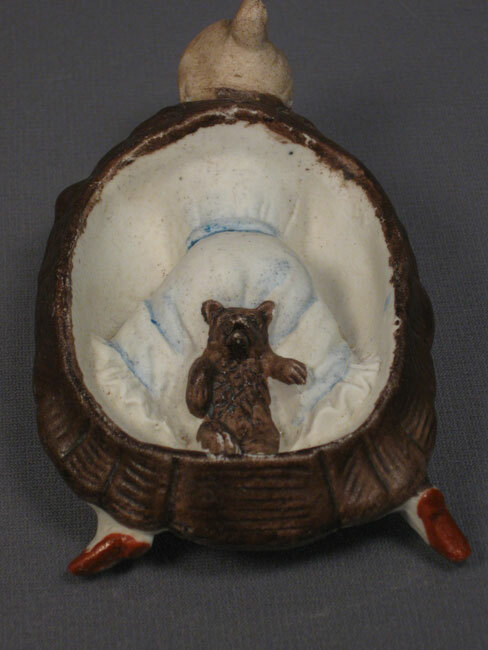 Or, as in the case of this figurine, her “bear” bottom is showing. We are pretty sure that this is the rarest version of this figurine. This very desirable bisque naughty turned up in a miscellaneous box of figurines at a yard sale about a week ago. I would have gladly paid more, but I was quite happy to part with a dollar for her. Finds like this are what make yard sales so much fun. This entry was posted in 1900's, Americana, Carol, Humor, Weird. Bookmark the permalink. I have the dark hair turtle shell bisque women with bare bottom and bloomers. Looking to sell her. She is in her last years now, and it would mean the world for her to finally see one again. I purchased one that I had found from an online source a year ago, but the seller broke it when she was packing it! Or would you consider selling the one you have? I am picturing a dirty old woman who now owns it !! I would love to find one. My grandmother had one that I was supposed to get. Looking for one like this. would love to buy one also, my grandmother left hers to me and I never received it. I have one of these wow. I’m missing the shell tho, crap.